At Esteem’s Boutique our goal is to offer flattering, unique fashion to real women at an affordable price. We listen to our customers and the request for cotton womens clothing is one we hear over and over. Our customers want flattering, easy wear clothing in natural, breathable fabrics; and they love vibrance, print and colour. When sourcing our fashion ranges these requests are top of mind and we think the Spring/Summer 2018 range is our best ever! Brands like Orientique, Cotton Village and Sundrenched are made from 100% natural fabrics and fashion labels Threadz and Clarity are increasingly using more and more natural fabrics in their range. To help you easily identify which styles are made from natural fabrics we have developed two icons which you will see on our product pages. There is a ‘Cotton Fabric’ icon on every cotton womens clothing style and a ‘Natural Fibres’ icon on all styles made from linen, rayon and cotton blends. At Esteems Boutique we are always striving to find the absolute best range of stylish, well fitting and affordable clothing on the market. We pride ourselves on finding unique vibrant clothing that will leave you looking and feeling fabulous. When we feel comfortable and happy in our clothing we exude confidence and love getting dressed each day. Our goal is for Esteem’s Boutique to be your go-to store for everyday fashion, special events and holiday styles. Orientique is an Australian fashion label synonymous with exclusive artistic prints, beautiful natural fabrics and exceptional quality. Designed in Australia and produced in India, Orientique specialize in the use of natural fabrics – cotton, linen and rayon – to produce their garments. Orientique cotton womens clothing is made with the Australian woman in mind, beautiful prints, great shapes and vibrant colours are trademarks of this label. The Orientique range is available in sizes 10 – 22 and new styles are available every few weeks. Sundrenched clothing is your go-to label for Summer. 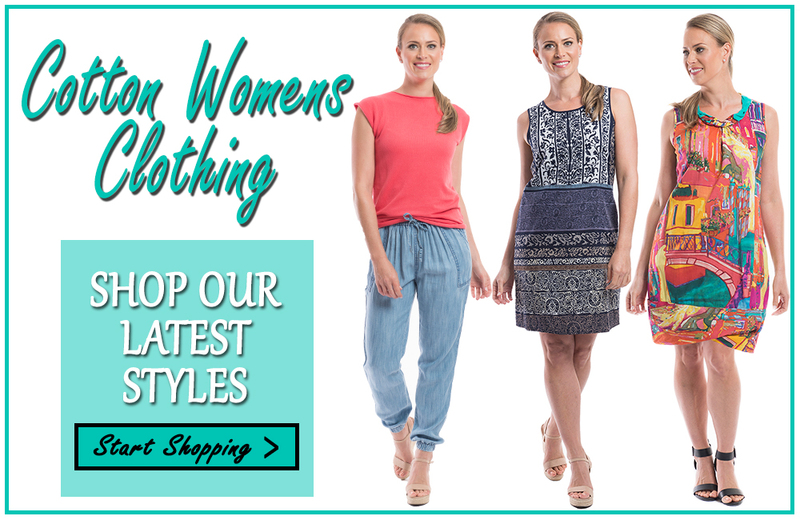 Featuring a huge range of womens dresses, tunics, tops and pants in lightweight, free flowing styles. With a great range of colourful prints, Sundrenched womens clothing is perfect for staying cool and stylish in the warmer months. Sundrenched pieces are easy fit styles with some fitting to a size 26. Threadz fashion celebrates the beauty of being a woman. A dynamic Australian designed womens clothing label focused on bringing affordable fashion that fits and suits women of all ages and sizes. Fitting up to a size 22, the Threadz clothing range features on -trend womens clothing that can be taken from day to night with ease. These stylish pieces are great for layering to achieve year round style. We are seeing more and more cotton womens clothing being produced by this label. Clarity by Threadz is an Australian designed label aimed at the fashion forward modern woman. The Clarity clothing label is both stylish and functional. Fitting sizes 10 – 22, Clarity womens clothing are a generous fit and cut to flatter a real womans figure. Natural fabrics are featuring heavily in the latest Clarity ranges with cotton/linen blends being very popular. The Clarity clothing range is perfect for women seeking great fitting, on trend ladies clothing.